I received this last night and installed it in about 1.5 hours. I thought It would be quicker, but that was only because I figured I could keep pace with the instructional video. I will be honest, if it wasn't for the superior customer service I've experienced with TST i would not have given this 5 stars. It is was a rather frustrating process at times and much of it seems like there could be an easier way. With that said, I am the consumer and the TST staff are the experts. I trust they made this as easy and quick as possible. I have 2 groms. I will be buying another one for my second grom now. Good job to the TST guys. Disadvantages: If you don't have the tools around you will need to acquire them for the job. May take longer than you expect. The plastic is thin which makes it hard to slide on a couple of clips during the process that is required. I was worried I would crack the plastic. 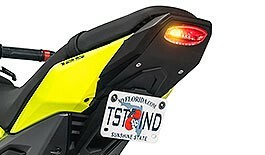 So I ordered this undertail fender eliminator kit for my 17 grom. The quality was as expected. It was fairly easy to install following the detailed installation video. It looks good, works good. My only problem was that they sent the wrong size lock nuts for the bolts that tie down the undertail base. I had to run to the hardware store to buy the right size lock nuts. It's no big deal, it happens. I wasn't going to wait for tst to send me the right size nuts which I'm sure they would've. I had my bike all torn apart and just wanted to get it back together. Over all I am extremely happy with this product. Would recommend. Preordered the kit and just installed on the evening of the 4th of July. When I rolled it out of my living room and out to the parking lot and instantly it got a lot of attention. By far the best looking tail section at the stunt spot. Install was super easy, did the relay, signals, and undertail with integrated light all in one shot. Maybe took 2 hours tops and that's with my 7 month old trying to eat my bike. Totally worth every penny. Advantages: Looks amazing, easy install. Smiles per dollars is about 10:1. Cheap price for very good quality. Customer service and support to help with any and all questions. Super fast shipping. And best of all its super bright. Even in day light. Disadvantages: Some vibrating noises, but may just be my tag. Shipping was very fast on this product. Everything needed was included. Totally changed the look of my Grom. Superb fit and finish, it's a bargain for the price. Advantages: Best looking fender eleminator on the market. Exceptional installation video on YouTube. What an awesome kit, its like its meant to fit. if tst even offered that plastic piece that you have to cut, PRE cut i probably would of spent the extra money and got that too, mind you its super easy to cut anyways. Disadvantages: not a damn thing. Best word to describe this system once installed is "STUNNING"!!! Advantages: Price is phenomenal for what you get. Overall appearance of my 2019 Grom is night and day from factory. Disadvantages: A little on the difficult side to install. I live in Sweden and it got here in about 6 days, really fast shipping! I thought the product was harder to install than it was and I have no mechanical background and I'm really with motorcycles and installing stuff. But it was really easy to do and easier than i thought. - Easy install even tho you have to saw off one piece of your motorcycle. - The bikes feels lighter. Hi guys, just wanted to thank you for the great job you're doing! My first purchase was 2 years ago for my 2006 cbr 600 rr and today i've installed your products on my 2017 grom. Fender eliminator, taillight, flushmount signals and flasher relay. As for my first purchase i'm very happy again !! Please notice that I'm in europe so I have to pay for international shipping and custom duties but in my opinion it's really worth it !! Advantages: Very easy install with detailed videos. What you see is what you get !! great quality products. Unique products you won't find elsewhere. Great customer service, fast answer to any question. I really like the look of this fender and would recommend it, the instillation was a bit harder then I expected because you have to cut off the old brackets for the old tail light. I really wish they told you how to install the turn signal resistors or else included the gen2-f relay because I have no clue how to wire up the resistors and my signals are just solid and don’t blink now. Bright brake light and turn signals. Disadvantages: You have to cut off some plastic brackets but overall it makes the tail more sleek. Does dot tell you how to wire up turn signal resistors.